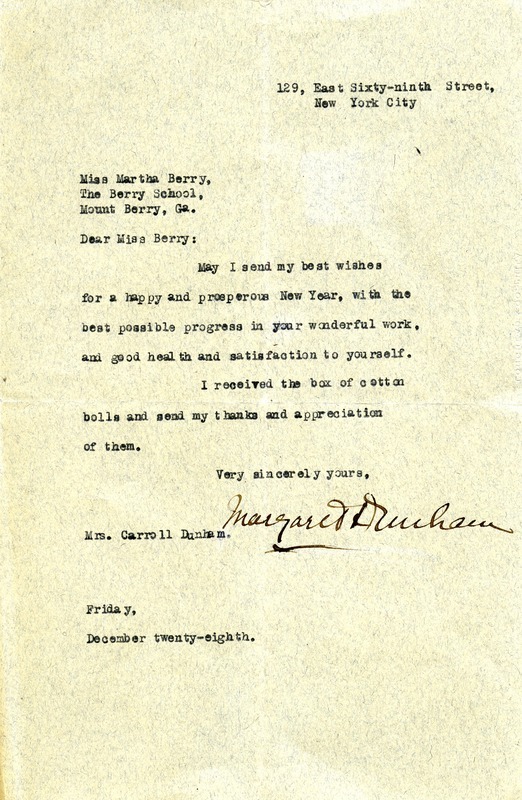 Mrs. Margaret Dunham sends her New Year's wishes and thanks Miss Berry for the cotton bolls she received. Mrs. Margaret Dunham, “Letter to Martha Berry from Margaret Dunham.” Martha Berry Digital Archive. Eds. Schlitz, Stephanie A., Olivia Mund, Meg Ratliff, Angela McCavera, et al. Mount Berry: Berry College, 2012. accessed April 21, 2019, https://mbda.berry.edu/items/show/9938.